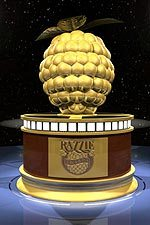 The 2019 Razzie Awards for the worst films of the year were presented February 23, the day before the Oscar ceremony as is the custom. Genre works were almost entirely absent from the list – which is good, right? – unless you count Sherlock Holmes parodies as genre, in which case genre won nearly everything…. Maybe it was destiny for a movie with a pile of poop as a central character. “The Emoji Movie” has received Hollywood’s most famous frown, the Razzie Award, for worst picture of 2017, making it the first animated feature in 38 years to earn the top dishonor. The nominations for the 38th annual Razzie Awards, to recognize the worst films of the year, were announced today, a day before the Oscar nominees come out. There are genre works in most categories – usually the same ones. Frequently nominated pictures include Transformers: The Last Knight, and The Mummy. 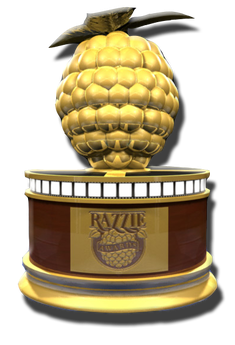 The 38th Annual Razzie Awards ceremony will be Saturday, March 3, the night before the 90th Academy Awards. (1) MONEY MANAGEMENT. Kristine Kathryn Rusch counsels authors in “Business Musings: Writer Finances Versus The Paycheck World”. Seriously, my writer friends. If you get a lump sum of money, pay off your house. Definitely pay off your credit cards, and take them out of your wallet. Use them only when you travel to a conference or plan to make a big purchase. If the indie writers who made a lot of money in 2012-2014 had followed that advice, they’d still be writing and publishing. Sure, their incomes would still be down, along with their sales, but their careers would continue. How do I know they didn’t do that? Because they’re gone. Mark Coker commented on it in his year-end blog. Writers in the comment section on this blog have mentioned that they’re leaving the business. The Kindle Boards discuss all the writers no one hears from any more. And if you go to writer website after writer website, many of them for successful indies, you’ll see sites that haven’t been updated for a year or two, or you won’t find any site at all. (2) COLLECTIBLES. The March WIRED has a photo essay called “Scene Stealers: Inside The Deeply Nerdy–And Insanely Expensive–World of Hollywood Prop Collectors.” (Online here.) This tells us that you don’t just want a phaser from the original Star Trek –you want a “hero phaser,” created by designer Wah Chang for close-ups, because only two were made. But if you want the Aries 1 Translunar Shuttle from 2001: A Space Odyssey, you’ve been outbid by the Academy of Motion Picture Arts and Sciences, who spent $344,000 on it for a museum the academy plans to open in 2018. The 2006 Worldcon makes an appearance, because the hero blaster used by Rick Deckard in Blade Runner showed up there after most collectors thought this prop had been lost because no one had seen it for over two decades. (3) READING THE TEA LEAVES. If you want to know “How China Became a Sci-Fi Powerhouse”, Foreign Policy Magazine’s Emily Feng will tell you – it’s the internet. Chen Qiufan, a sci-fi writer who has won the Milky Way Award and Xingyun Award, China’s equivalent of the Hugo, remembers life before the web changed everything. “All we could do was write in paperback books and magazines. We sent out our stories on paper by mail,” Chen told Foreign Policy. Sending them out and waiting for a response and feedback took a long time — sometimes forever.” But the early 2000s saw an explosion of dedicated online sci-fi forums that allowed writers and fans to mingle virtually, swapping stories, publishing serialized works, and exchanging intense feedback. Social media sites like Baidu Tieba, the arts and literature-focused site Douban, and college messaging boards hosted the most active online communities. Suddenly, anyone could be a writer; and writers could get instant, massive feedback on draft work. This development was particularly important for the heretofore much-ignored genre of sci-fi; a large portion of today’s most well known and decorated Chinese science fiction writers did not start inside the formal publishing and literary world. For decades, legacy heroes have been associated strongly with DC Comics rather than Marvel, and for understandable reasons. Apart from DC’s Trinity of Superman, Batman and Wonder Woman, most of its big name superheroes were reimagined into younger, more modern incarnations during the Silver Age. While DC’s creators eventually settled on the idea of the multiverse as the in-universe explanation for two radically-different Flashes or Green Lanterns, these stories helped to build an expectation among readers that as characters aged, they might be replaced. The DC Universe is full of legacy heroes; there are now enough Green Lanterns to necessitate a whole Corps, nearly as many Flashes, and more Robins (and former Robins) than grains of sand on the beach. While the focus ebbs and flows between the iconic versions and their legacies, the idea of legacy heroes is so engrained in DC Comics that not even the New 52 could kill it. Last week, Marvel released an incredible new piece of art by Alex Ross, accompanied by four simple words: “GENERATIONS – coming Summer 2017.” It is not clear yet whether “Generations” will be a new prestige miniseries, event, or line-wide rebranding a la Marvel NOW, but the name and image highly suggest whatever “Generations” is, it will focus on the idea of legacy heroes in the Marvel Universe. (5) COMICS ART. Elle Collins curates a gallery of Silver Age sci-fi comic book covers at Comics Alliance. While the Golden Age established comics as a medium, the Silver Age was when comic book art really came into its own. And it’s worth noting that comics’ Silver Age corresponded with a wider cultural fascination with science fiction. The actual Space Race was in full swing, and everybody was thinking about rocket ships, alien monsters, and the wonders of science. In comics, it was science fiction that gave comics artists the freedom to go big. Giant monsters, futuristic technology, and huge-scale threats to the entire Earth became commonplace. And of course everyone had their own ideas about what aliens might look like, from the typical little green men with antennae to yellow giants with segmented eyes and butterfly wings for ears. In assembling this Silver Age sci-fi gallery, I looked for covers that had more science fiction elements to them than just giant monsters, because while there’s overlap, I think giant monsters deserve their own gallery. I also avoided superheroes, because while so many of their stories are science fiction by nature, we understand superheroes as a different genre. Plus this whole gallery could easily be filled up with Fantastic Four and Green Lantern covers, but that would be a different thing. Sci-fi heroes like Adam Strange and Captain Comet were allowed, on the other hand. (6) NANCY WILLARD OBIT. Black Gate reports the passing of author Nancy Willard, June 26, 1936 – February 19, 2017. Nancy Willard was the author of more than 70 books, including more than 40 books for children, such as the Anatole trilogy, Firebrat (1988), East of the Sun and West of the Moon: A Play (1989), and Pish, Posh Said Hieronymus Bosch (1991), illustrated by the Dillons. She won the Newbery Award in 1982 for her book of poetry, William Blake’s Inn, illustrated by Alice & Martin Provensen. It was the first book of poetry to win the Newbery. Willard’s Things Invisible to See won the William L. Crawford – IAFA Fantasy Award for first fantasy book (1986). The family obituary is here. (8) PATRON OF THE ARTS. 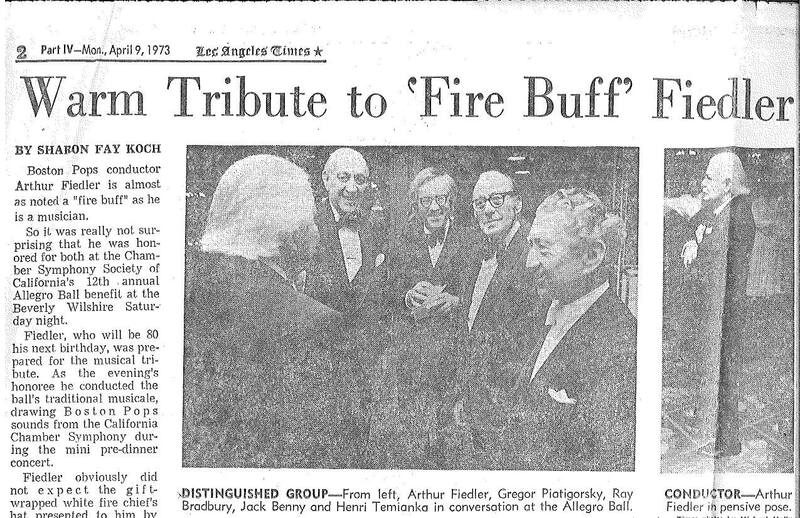 Ray Bradbury was on the Chamber Symphony Society of California’s board of directors, as this 1973 clipping reminds us. (9) HELLO, CENTRAL? In “The Coming Amnesia”, Geoff Manaugh explores a prediction made by Alistair Reynolds that if the universe keeps expanding, galaxies wouldn’t be able to communicate with each other and any interstellar civilizations would be unable to contact any other ones. …It is worth asking here, however briefly and with multiple grains of salt, if something similar has perhaps already occurred in the universe we think we know today—if something has not already disappeared beyond the horizon of cosmic amnesia—making even our most well-structured, observation-based theories obsolete. For example, could even the widely accepted conclusion that there was a Big Bang be just an ironic side-effect of having lost some other form of cosmic evidence that long ago slipped eternally away from view? (10) THE CAMPAIGN TRAIL. Dave Langford reports that in addition to their 2017 TAFF ballot platforms, all three candidates have since posted campaign material online. Click on each name for more: Sarah Gulde, Alissa McKersie, John Purcell. (11) INTELLIGENT TALK. Kim Stanley Robinson and a non-genre author will be interviewed by Adam Roberts at Waterstones in London on April 3. Waterstones Piccadilly is delighted to announce a very special event featuring three exceptional authors. Kim Stanley Robinson and Francis Spufford will be discussing their work with critic and author Adam Roberts. Kim Stanley Robinson is widely regarded as one of the foremost living writers of science-fiction. Author of the bestselling Mars trilogy as well as numerous works of fiction and non-fiction, he has won many awards over the years, including multiple Hugo and Nebula prizes. Francis Spufford teaches writing at Goldsmiths University and has written 5 highly-acclaimed works of non-fiction. His first fiction title, Golden Hill, was a Waterstones Book of the Month and won the 2016 Costa Prize for First Novel. Adam Roberts has written an extensive collection of works in both the fiction and critical genres. Author of some wonderfully original science-fiction and parody titles, Adam teaches English literature and writing at Royal Holloway University. (13) NOT BEEN BERRY BERRY GOOD. The 2017 Golden Raspberry Awards, a.k.a. The Razzies, highlighting the “cinematic sludge” of the past year, were announced today. If you can look past the draconian dystopia of the world presented in the movie, you’ll find a lot of interesting scientific details “Minority Report” strived to get correct. Steven Spielberg consulted with computer engineers to come up with the now-iconic vision of the next gen computer systems. While our current touchscreen devices aren’t exactly what was depicted in the film, we are getting closer to gesture-based interfaces. (15) INKSTAINED WRETCH. Jon Skovron, author of Hope and Red and Bane and Shadow, gives us an insight into how he writes, from first draft to the final book. (16) THUG NOTES OF GENRE INTEREST. Selected by John King Tarpinian. (17) SUMMER CAMP. Tor.com says “Shared Worlds is Now Open for Registration!” Shared Worlds is supported by co-director Jeff VanderMeer and Editor-in-Residence Ann VanderMeer. Shared Worlds, a world-building summer camp for kids, is now open for registration. The program is open to rising 8th-12th graders, and will take place from July 16th-29th at Wofford College in Spartanburg, South Carolina. Registration will be open until April 1st so be sure to register soon! The students work in small groups with an experienced “world-building coordinator” to design and build a world, spending a week building their worlds from the ground up: geography, population, religion and philosophy, legal systems—everything you’d need for a functional world. The second week is spent writing stories that can only occur in the worlds they’ve created. The program culminates in individual sessions between the students and the guest authors so the students get personalized feedback on their work. Finally, the students’ stories are published in the annual program anthology. (1) SOMETHING IN THE AIR. Ellen Cheeseman-Meyer interviews Lois McMaster Bujold at Tor.com: “Fanzines, Cover Art, and the Best Vorkosigan Planet: An Interview with Lois McMaster Bujold”. Everyone will have a favorite section – here’s mine. ECM: You published a Star Trek fanzine in the 1960s, while the series was still on the air. It’s the fiftieth anniversary of Star Trek, so I can’t resist asking you about it. What was it like to be a fan writer in the 1960s? LMB: It was a lonelier enterprise back then than it is now. I go into it a little in this recent interview. Fan writing, at the time, was assumed to be writing more about SF and fandom, what people would use blogs to do today, than writing fanfiction. So an all-fiction zine seemed a novelty to some of our fellow fans in Columbus. John Ayotte! There’s someone I haven’t heard of since I was a young fan. (2) A GR8 NAME. It’s only fitting that the official Star Wars site be the ones who tell us: “The Official Title for Star Wars: Episode VIII Revealed”. 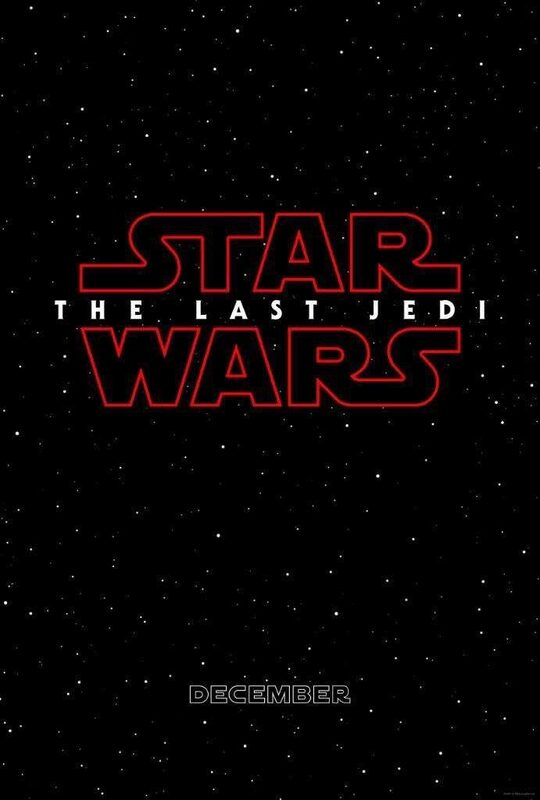 THE LAST JEDI is written and directed by Rian Johnson and produced by Kathleen Kennedy and Ram Bergman and executive produced by J.J. Abrams, Jason McGatlin, and Tom Karnowski. STAR WARS: THE LAST JEDI is scheduled for release December 15, 2017. The “winners” will be announced February 25, the day before the Academy Awards. (4) CLARKE ESTATE SUES. 2001: A Space Odyssey is one of the works recast as a “study guide” for elementary school readers. Publishers Weekly has the story: “PRH, S&S Sue Moppet Books’ KinderGuides for Infringement”. Penguin Random House and Simon & Schuster have joined with the estates of Ernest Hemingway, Truman Capote, Jack Kerouac and Arthur C. Clarke to file a lawsuit against Frederik Colting, Melissa Medina, and their publishing firm, Moppet Books, charging copyright infringement. Filed January 19 in the Southern District of New York, the suit alleges that Moppet Books’ KinderGuides, a line of illustrated children’s adaptations that feature versions of The Old Man and the Sea, Breakfast at Tiffany’s, On the Road, and 2001: A Space Odyssey, with “willful copyright infringement of four acclaimed copyrighted classic novels.” The suit notes that PW wrote about the launch of the KinderGuides in August 2016. However, it is only in the last few years—especially since he and Stanley Kubrick wrote “2001: A Space Odyssey”—that he has become widely known to the general public. He became even more widely known, of course, during the recent flight to the moon, when he served as one of the commentators assisting Walter Cronkite in his coverage of the event for the Columbia Broadcasting System. Cronkite has been a Clarke fan for many years, and Clarke has done a number of television broadcasts with him, beginning as far back as 1953. In following the Apollo 11 flight, Clarke made some dozen appearances. During an early one, Cronkite asked him if he would mind explaining the ending of “2001,” and Clarke answered that he didn’t think there was enough time—then or later. He went to Cape Kennedy with the C.B.S. team, and at the moment of the launch, as he told a friend on his return, he, like everyone around him, burst into tears. “I hadn’t cried for twenty years,” he said. “Right afterward, I happened to run into Eric Sevareid, and he was crying, too.” After the launch, Clarke returned with the rest of the C.B.S. crew to New York and spent most of the next several days in and out of the C.B.S. studios, watching the flight and, from time to time, going on camera. The actual landing on the moon was, in many ways, the fulfillment of a life’s dreaming and prophesying. “For me, it was as if time had stopped,” he said later. (6) 2001 ON THE CUTTING ROOM FLOOR. Sci-Fi writer-director-producer Marc Zicree went to Stan Lee’s Comikaze Convention for his Space Command panel and ran into 2001: A Space Odyssey star Keir Dullea, who shared a scene cut from the film — and re-enacted it! January 23, 1957 — Machines at the Wham-O toy company roll out the first batch of their aerodynamic plastic discs–now known to millions of fans all over the world as Frisbees. 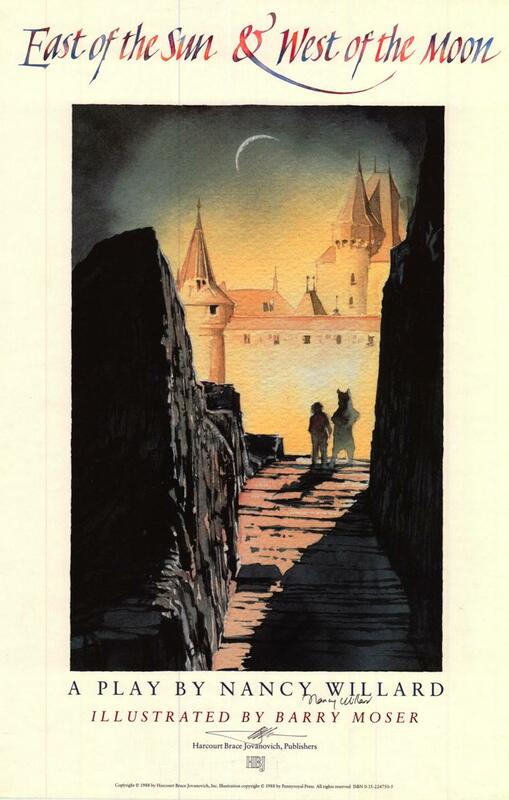 January 23, 1923 – Walter Miller, Jr., author of A Canticle for Leibowitz. Born January 23, 1954 – Craig Miller, animation writer, and early leader of the Official Star Wars Fan Club. (10) THEATER OF THE IMAGINATION. Turner Classic Radio hosts vast quantities of Golden Age shows, which evidently are free to listen to. Includes lots of superheroes (Superman, The Green Hornet) and suspense (Suspense, what else?). (11) SEVENEVES? Mental Floss compiled a list of “86 Books Barack Obama has recommended during his presidency”, including the Harry Potter series, Seveneves, and The Three-Body Problem. (12) SIGNERS OF THE TIMES. The Change.org petition to “Repeal California Assembly Bill 1570” (the new law about sale of autographed items) now has 1,612 signatures. Nearly everyone in California is impacted by AB 1570, California’s new autograph bill, because it affects everyone with a signed item in their possession, whether it’s a painting passed down through generations, an autographed baseball, or a treasured book obtained at an author’s book signing. Under the new law, when a California consumer sells an autographed item worth $5 or more, the consumer’s name and address must be included on a Certificate of Authenticity. This requirement applies to anyone reselling the item as authentic, be it a bookseller, auction house, comic book dealer, antiques dealer, autograph dealer, art dealer, an estate sales company, or even a charity. AB 1570 is fatally flawed and must be repealed with immediate effect. It is rife with unintended consequences that harm both consumers and small businesses. It has been condemned by newspaper editorial boards and the American Civil Liberties Union. (13) EXPLORE SPACE IN THE DISCOMFORT OF YOUR OWN HOME. A BBC reporter speaks of the “lucky” people who have been to ISS, but discovers in just 48 hours that it’s not the least like fun and games: “My unhappy 48 hours as an astronaut”. Yet, it is not always necessary to travel into space to experience what it is like living as astronauts do. It may come as a surprise to discover on Earth, dozens of people all over the world have spent months, and even over a year, living in specially built confined spaces that mimic life in space. These simulation pods are found in places like China, Hawaii and Russia, giving researchers the ability to study the effects of long-term isolation and confinement on people in preparation for long-haul space travel. To find out what it might be like, for 48 hours, I tried to live just as astronauts do – attempting to keep up with the schedule of crewmembers on the ISS. As it turns out, they have a very tightly packed workday. I woke up, drank coffee, ate not-so-great food directly from the bag, worked out, worked and repeated the pattern until the day was done. Oh, and I had to spit into a towel twice a day after brushing my teeth. (14) NO. 1 SHOULD BE NO SURPRISE. Blastr lists “The top 11 composers who have created musical masterpieces for geeky properties”. If you’re a Doctor Who fan, you know the music of Murray Gold. Gold has been the composer for the popular series ever since it returned to television in 2005. Composing for such distinguished Doctors as Christopher Eccleston to Peter Capaldi, he’s created some of the best themes and music in the series’ more than 50-year history. His unforgettable work includes “The Doctor’s Theme,” “Doomsday,” “This is Gallifrey: Our Childhood, Our Home,” and “I Am the Doctor.” His music has made us feel like we’re on other planets, in a different time period, and traveling through time and space in the TARDIS. Gold also created the themes for the spin-offs Torchwood and The Sarah Jane Adventures. Out of all of Gold’s work, his theme for the current Doctor stands out from the rest. It’s like nothing we’ve heard before in the series and captures Capaldi’s Doctor perfectly, more so I think than a theme has fit any of the previous Doctors. Listening to it, you get a sense of mystery, danger, wonder, adventure and determination. There’s gravity to it as well as playfulness. Gold laces it all together into a complex, catchy piece that makes it hard not to picture everything the Doctor has been through, all he has done and all he will continue to do. Have you ever posed for a photo with your index and middle fingers raised, indicating your desire for world peace? Probably, since the sign has become shorthand for the sentiment after Vietnam War activists popularized it in the 1960s. But researchers in Japan warned this week that those flashing their exposed fingertips were at risk of fingerprint theft, which in turn could be used for any number of things, like unlocking your iPhone. Isao Echizen, a researcher at the National Institute of Informatics, said that he and his team were able to lift the fingerprints from someone’s fingers from a photo taken about nine feet away, according to Phys.org. (16) MAKE AMERICA SMART AGAIN. 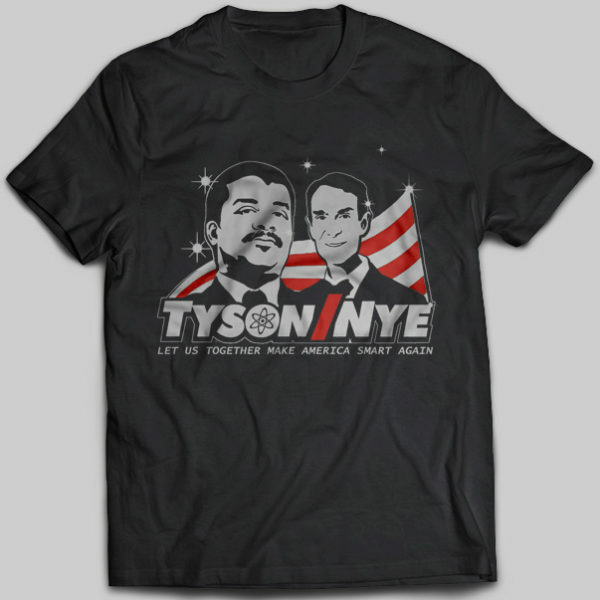 Owning this shirt will give you an IQ bonus.